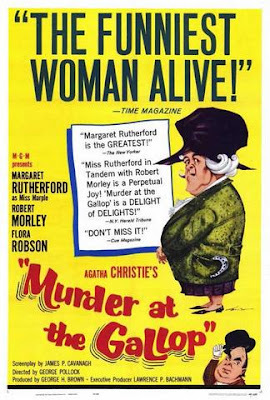 Today, I'm writing about the four movies actress Margaret Rutherford made as amateur sleuth Miss Marple. 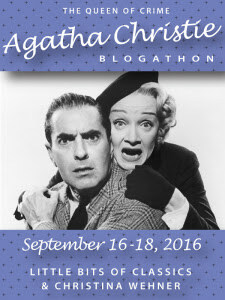 This article is part of The Queen of Crime: Agatha Christie Blogathon hosted by Little Bits of Classics and Christina Wehner. There are few pleasures in life as rewarding as a good mystery, and the four movies actress Margaret Rutherford made as amateur sleuth Miss Jane Marple are fun, breezy whodunits that, while not faithful adaptations of British writer Agatha Christie's work, are a showcase for talents of the indomitable Rutherford. Today, I'm going to look at all four of Rutherford's Marple movies, and let you know where you can watch them, but first here's a little background. Miss Jane Marple of the fictional village of St. Mary Mead, England, was created by Christie from childhood memories of the elderly ladies, including her step grandmother and aunt, who kept track of the lives, loves and crimes of the residents in small English villages (Christie probably got the name Marple from either a railway station or a house called Marple Hall). Miss Marple, who solves crimes that baffle the police through her sharp memory and knowledge of human nature, first appeared in the short story, "The Tuesday Night Club," in 1927, and she immediately became one of Christie's most popular characters, appearing in 12 novels and 20 short stories. Despite the character's popularity, Miss Marple didn't appear onscreen until executives at MGM's British studios approached the 69-year-old character actress Margaret Rutherford, who was a comedy star on both stage and screen. Rutherford, who was known for playing eccentric characters like psychic Madame Arcati in Blithe Spirit (1945) and Miss Prism in The Importance of Being Earnest (1952), was at first reluctant to take on the part -- she felt murder mysteries weren't "morally uplifting" -- but she eventually agreed under certain conditions. Rutherford stipulated that she must wear her own wardrobe and that her husband, actor Stringer Davis, should appear in the movies with her. Rutherford's Miss Marple movies, starting with Murder She Said in 1961, were wildly popular at the box office even though Christie was reportedly very unhappy with the films, which took many liberties with her carefully crafted plots, and with Rutherford's brassy portrayal of Miss Marple. However, Christie and Rutherford did strike up a friendship during the making of the Marple movies, and Christie dedicated the novel, "The Mirror Cracked From Side to Side," to Rutherford. 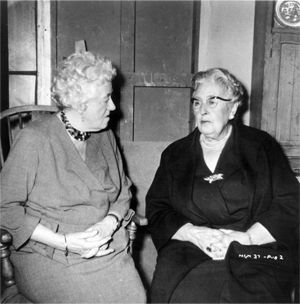 Margaret Rutherford and Agatha Christie enjoy a chat. It is certainly true that the statuesque, outgoing Rutherford is nothing like the thin, demure Miss Marple of the books, but I still find the Rutherford movies highly enjoyable for their breezy plot lines, great actors, and the interactions between Rutherford and Davis, who were one of the great love stories of British theater (Davis plays the local librarian Mr. Stringer, who never appears in any of Christie's novels). 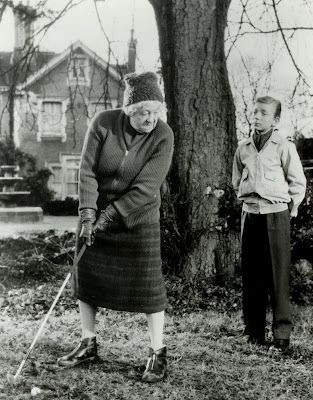 Margaret Rutherford and Ronnie Raymond in Murder She Said (1961). In this movie, based on the novel "4:50 from Paddington," Miss Marple is a mystery-loving elderly lady living in the quiet English village of Milchester. While taking a train, she spots an unknown assailant murdering a young woman. The police, who can't find a body, dismiss her as a dotty old lady, so Miss Marple, with the loyal assistance of Mr. Stringer, decides to investigate herself. This is the most faithful of the four movies to Christie's original work, and it also sets the comedy/horror tone for the rest of the series. There are great British actors filling in the supporting parts, in this case James Robertson Justice as an invalid millionaire and future Miss Marple Joan Hickson as a slovenly housekeeper, and Ron Goodwin's unforgettably groovy score. DVD. This movie, based on the Hercule Poirot novel, "After the Funeral," finds Miss Marple going undercover at a fox-hunting inn to investigate the mysterious death of a local recluse (Finlay Currie). The highlights of this film are the great cast, including the always endearing Robert Morley as a bumbling innkeeper who has a crush on Miss Marple and Flora Robson in a sensational performance as the seemingly mousy Miss Milchrest, and Miss Marple and Mr. Stringer hitting the dance floor for a memorable rendition of The Twist. TCM at 2:45 p.m. Nov. 12. DVD and video on demand. Here's the trailer. 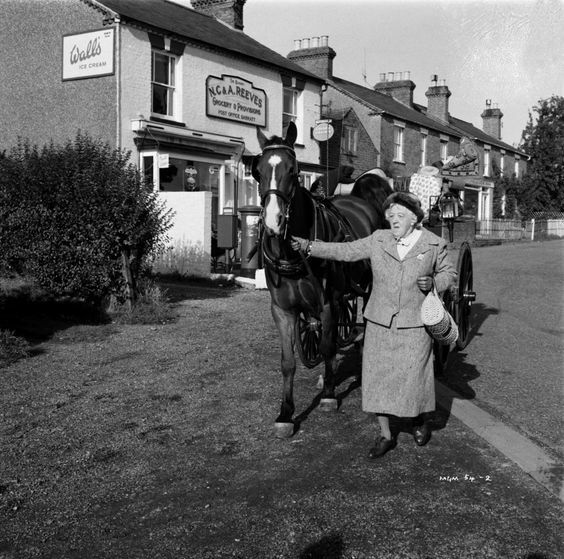 Margaret Rutherford on the set of Murder Most Foul (1964). This movie, based on another Poirot novel, "Mrs. McGinty's Dead," finds Miss Marple joining a theatrical company after a local woman with connections to the theater is murdered. The underrated Ron Moody gives a wonderful performance as a hammy theatrical manager, but the highlight of the movie is Rutherford's dramatic recitation of the poem, "The Shooting of Dan McGrew." DVD and video on demand. 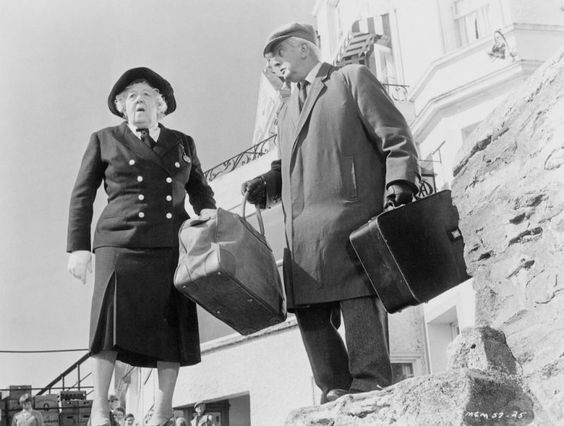 Margaret Rutherford and Stringer Davis on the set of Murder Ahoy (1964). This movie is based on an original screenplay by David Pursall and Jack Seddon, but it does have quite a few elements from Christie, including borrowing plot points from her Miss Marple novel, "They Do It With Mirrors." In Murder Ahoy, Miss Marple is a trustee at a boy's reform institution that takes juvenile delinquents out to sea as part of a reform program. When one of her fellow trustees unexpectedly dies, Miss Marple decides to go aboard ship to find out what really happened. The highlights of this film are the beautiful location shooting in Cornwall and the spry 72-year-old Rutherford in a sword fight. DVD and video on demand. I'll leave you with Ron Goodwin's memorable theme song for Miss Marple, which features the jazziest harpsichord this side of The Addams Family. These look like so much fun! I have not yet seen ANY of these films and must dash out to find them. The horror/comic combination is very intriguing, too. Gotta love that jazzy harpsichord, too! I really enjoyed your overview of this series. I'm so glad you could join us on this celebration of Agatha Christie! Thanks for hosting. I really enjoyed writing this article. I just watched Murder Ahoy two days ago ( for the umpteenth time ) and I never tire of it. All of the Rutherford Marple films are jolly fun. Thanks for helping spread the word about the movies! I read your great article while doing research for this post. If I could have a theme song, it would be the one Goodwin fashioned for Miss Marple. While Margaret Rutherford is not my ideal version of Jane, she is my ideal version of Margaret Rutherford and her greatness combined with these tidy mysteries is always a treat. Also, I think the opening of "Murder Most Foul" is very inventive and pulled off perfectly. Murder Most Foul is my favorite of the series. I especially enjoy Ron Moody and I thought the murderer reveal scene was great too. As much as I love Poirot I'm a new convert to Miss Marple so I all of the Margaret Rutherford films to watch - they sound hugely entertaining. They aren't very faithful to the books, but they are hugely entertaining. I'm more familiar with Hercule Poirot. I must confess I know very little of both Miss Marple and Margaret Rutherford, but this means I'm in for a treat! Thanks for showcasing these movies in your post. 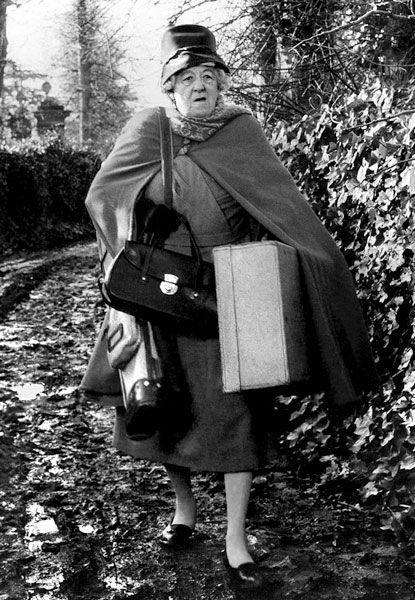 Absolutely without a question Margaret Rutherford is a Star sleuth! I just love her! She has the face of a loveable bull dog! What a detective! She just keeps me laughing!! She just lightens & brightens your day (even if it is a rainy day!) ---and anyone can always use a good laugh!